The Origins Of Indigenous Sasak Houses Need You Know. You definitely agree home of the indigenous Sasak is indeed unique. Sasak this is tribal and tribal majority contained in Lombok, West Nusa Tenggara. Sasak culture has a system that you can learn in the book of Nagara Kartha Gama bouquet Masters Nala from Majapahit. Books which record regarding cultural system Sasak. You can see from the Scriptures that historically the system already established a Sasak culture, this tribe has the ability and determination to safeguard and preserve the tradition. 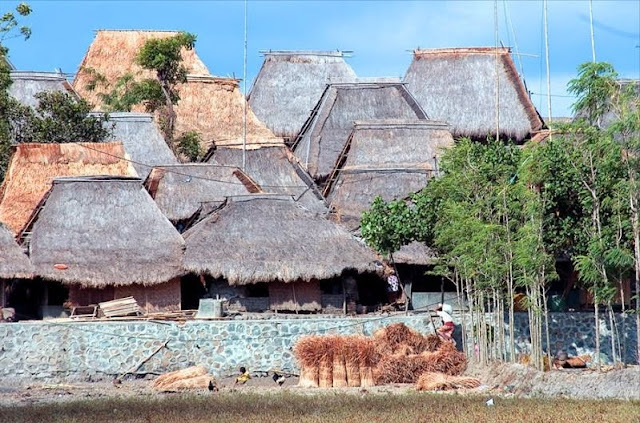 You can see evidence of Sasak culture has survived until now, namely the shape of the custom home building. You surely understand that the House was not just a building. Home is where the family took refuge either in a physical or spiritual as well as physical or spiritual. So, if you thoroughly each House a traditional or customary, you'll find not just a building. However, built with aesthetic value and the local culture of each society. It's also that you will find at traditional house Sasak. Sasak houses not only as places to live but also as the site of the inaugural ritual customs and religious rituals. Judging from the accounts of indigenous Sasak houses you'll surely see its simplicity and unique, but the terms would have to mean. The roof of his house made of straw and a wall made of woven bamboo called bedek. The most unique is the land that became the floor. This land is a mixture of clay and Buffalo dung would make dirt floor hardened like cement. The uniqueness of this floor was inherited by the ancestors of the Sasak. Cool home traditional sasak you won't find nails. In fact, as you know the iron nail is an important material for making a home. Home traditional Sasak this entire material uses wood and bamboo, to connect parts of the Foundation uses wooden nails made of bamboo. The meaning is contained of Sasak traditional House. That the House is in the dimension of sacred or Holy and profane or mundane simultaneously. This means that the Sasak traditional house beside as shelter and gathered family members also become a venue for sacred rituals. To preserve the indigenous Sasak House, parents told her children that they should build a House such as the existing model if not better out of the Kampong. Indeed the parent command is heard to reply such as forcing, but forced to favor better isn't it?